However, a close scrutiny of the photo from which the tattoo artist used to come up with the permanent tattoo on Barbie's back clearly shows that the two guys are different. It's only after the photo and the tattoo are put together that the idea of Bobi comes into context, however, those who know Bobi so well would be quick at telling you that the person on Barbie's back is not Bobi. The tattoo falling short of looking like Bobi exactly does not change the way Barbie feels about her Ghetto president and bearing the pain to have that gigantic tattoo is in itself a bold move on Barbie's part. 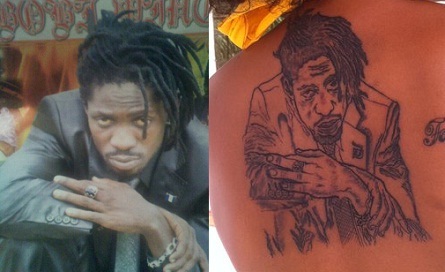 Meanwhile, what disturbed some of their fans was that after Barbie had decorated her back with Bobi's portrait, he retaliated with a very small tattoo of a totally different thing.